Click to listen to audiobook excerpt. Watch Tania discuss Mother Tongue on Matthew Félix on Air. Or listen to the podcast. 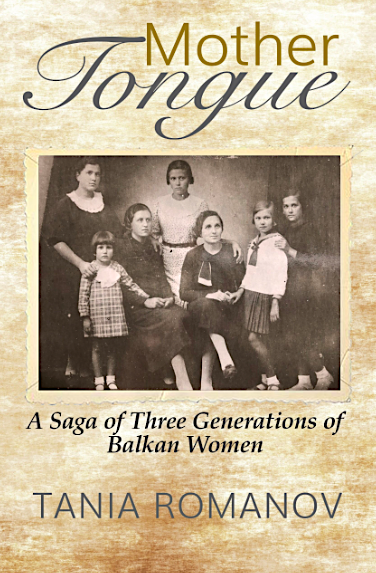 Mother Tongue explores the arc of author Tania Amochaev's life through the prism of her maternal parentage. Grandmother Katarina returns from exile during World War I bearing a child of unknown parentage; Mussolini's subsequent rise in Italy toys with the fate of her Istrian homeland and leads to her family's eviction to a peripatetic life in the newly formed but eventually ill-fated country of Yugoslavia. Mama Zora, the last child born in Istria, feels Yugoslavian to her core until her own family is exiled as part of the emerging Cold War with Russia, her husband's homeland. — Gay Wind Campbell, "Images Par Deux"
Tania, born in Belgrade months prior to that final eviction, spends her young childhood in a refugee camp before moving to San Francisco, where she grows up in a multicultural and multilingual environment to become a successful high technology executive. The birthplace listed on Tania's passport changes five times in as many renewals as conflict won't release the countries where her mother's sisters end up on opposite sides of wars. Tania learns you don't escape your past when a surprise document appears in the mail: Serbian citizenship certification for one Tatjana Amočajev.